If you are looking for tough, long lasting chew that will not be demolished within a day or week, try these. Buy the right size for the breed and we guarantee they last in a non-sticky, non smelly, healthy way. 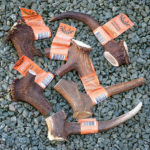 The darkest, top quality deer antler dog chews on the market. You love dogs, we love dogs, I love dogs……………. treat yours today. Staglers 100% Natural Deer Antler Dog Chew – Extra Large. The future of dog chews for years to come, plenty of stock for your pet! Sold Individually. All dogs deserve a treat even if they are a large breed of dog with strong jaws. If you have a problem with your dog chewing through the paler white antlers from big retail pet stores we have a solution. Ours are different as they are dark, dense and strong. Tell us the size of your dog and we will ensure the right chew. If you are looking for tough or long lasting chews that will not be demolished within a day, try these. Why are they so good for your dog? Interesting to the dog and not smelly to humans and do not stain, great news! They are similar in hardness to a Nylabone, but tastier and healthier. Unprocessed and natural they compliment the BARF diet and are suitable for sensitive tummies. Known by vets to aid the cleaning of teeth helping to maintain fresh breath and healthy gums for your dog. 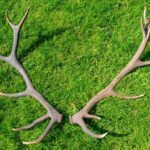 Guaranteed, premium quality Red deer antler which is naturally shed every year – and then, those same Stags go off and grow an amazing new set to impress the girls ready for the next mating season! This is a totally natural, unprocessed, clean, nutritious, long-lasting product. They also make excellent gifts for man’s best friend. Important FACT: Staglers 100% Natural Deer Antler Dog Chew – Extra Large Size will be between 225 and 350 grams. We pride ourselves on giving you the best weights possible. 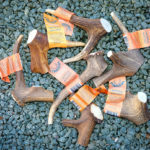 You can feel good about giving your dog an antler chew from Staglers. Each spring male deer they lose their antlers, after mating, which will then start growing again, year on year. Our antlers are collected from free ranging deer in southern Europe, brushed, hand cut and graded on weight. As antler is a purely natural product they all differ in colour, weight, shape and thickness. We guarantee we only buy the Top Grade A, premium quality antler we do not buy lower grade, white antlers, as these do not last long and can splinter. Our Ethos is to be as eco-sustainable as possible, from process to packaging. Some dogs will chew a Stagler all day if you let them. Please do not. It is very important that you monitor your dog whilst chewing and do not leave it with them for too long. After all you are giving a hard, nutritious treat! Your dog will know what to do with their treat. Leave it for him to work out how to enjoy it. Make sure your dog is gnawing on the antler chew and not trying to break it in half. Don’t hold the antler chew for him as this may cause him to bear down on it. Please don’t leave their Stagler outside, it’s not sticky so put it somewhere safe, where other creatures (i.e. slugs) can get to them, to safeguard your dog’s health. To avoid a choking risk take the Stagler away from your dog once it gets worn down to a small enough size that your dog could easily swallow. Always supervise your dog when chewing..